We survived the Big Birthday Bash recently – not for the men-children though, but for Father of a Man-Child. 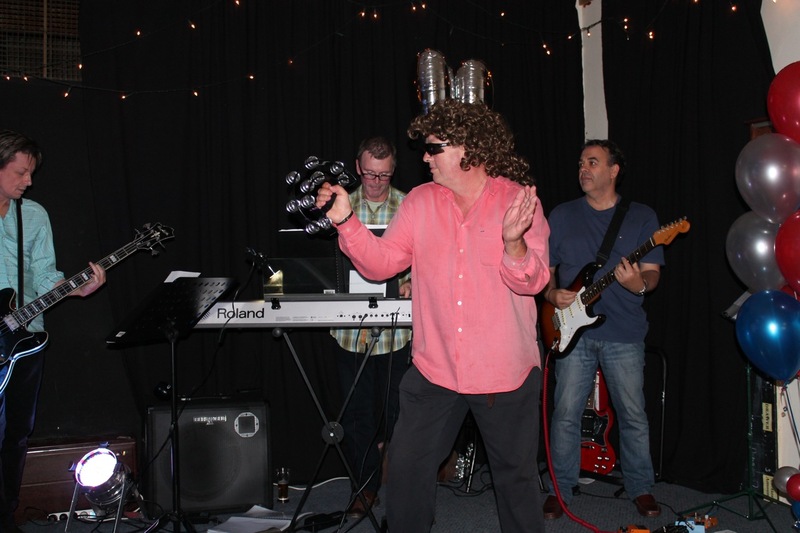 He decided at the age of 55 (yes he is WAY older than me) that the time was right for a birthday party, and not just a small, intimate, grown up gathering, but a proper Rock’n’Roll birthday bash, complete with a live band at the local RSL (oh yes, we’re talking very up-market)!! To show he has grown up and is quite capable of being a fully independent thinker (he was definitely making a not very subtle point to me his controlling wife), he proceeded to organise the entire party himself, including invitations (pretty cool actually), invite list (yes, I got no say at all, luckily he did extend the invitation to my immediate family), venue, band, and food. At some stage, I did manage to prise some details from him about the food menu he was planning, which is when I decided to exert my influence. Now there is cheap and cheerful, and then there is downright awful. I explained that if he wanted me to attend and not die of absolute embarrassment in front of my friends (yes he invited some of them too), that he was not going to serve 4’n’20 pies and sausage rolls and sandwiches from the local deli! Yes I know it’s the RSL (in need of a serious update, but still a fabulous venue), however we can still provide gourmet food even if it’s not in keeping with the hideous carpet and outdated decor of the place. I also gave him some tips about having hired help for food service – I for one wasn’t planning on spending the party in the bowels of the RSL, and I explained that the men-children were not equipped to manage the food either (unless you’d like every guest to end up with salmonella poisoning). I was inspired to order some last-minute helium balloons to decorate the place, which was our little birthday surprise for Father of a Man-Child. He definitely liked that, almost as much as Sister of a Man-Child who could barely contain her excitement for 24 hours! There was one small hiccup on the day, which centred on the dress code. The invitation clearly stated “Dress Code: Strictly Status Quo, Rolling Stones and the like.” Naturally, I ignored it completely, and when any of my friends asked, I told them it was optional, in keeping with Father of a Man-Child’s non-committal attitude. His advice – “just wear jeans and a leather jacket, that’s rock’n’roll anyway”. Not surprisingly there was a mixed bag of dress code at the party, ranging from the likes of me (not an ounce of rocker), to the token t-shirt borrowed from a teenage son, worn under the leather jacket (I swear there were quite a few “originals” at the party), to my friend, Mother Who Works, who shamed us all with her fabulous rocker style on the day. I thought she looked fabulous, definitely BOG, however it seems she nearly died of embarrassment and kept telling me she wanted to go home and change – I am sure there were many envious looks thrown her way for those killer boots and white faux fur jacket. The men-children turned up for the party – one was very helpful, the other eventually arrived late and left early (sigh). They looked thoroughly bored during the entire event, but I really don’t care – it was important they were there. I’ve been dropping hints about how good the venue was hoping the boys might consider it for their 18th birthday party/ies. I think I am delusional however – one probably thinks it’s the most down-market place you could ever have a party, and the other one would probably rather not have a party than have his embarrassing family at his 18th, such is his connectivity with us right now. Ah, the joys! Anyway, Happy 55th Birthday Tambourine Man, it was a great bash!! If you’d like to see Mother Who Works in her splendid outfit, you can read about her Bridget Jones moment here. I celebrated a birthday recently. The best bit about the day wasn’t the presents (which I’d shouted myself anyway), or turning a year older (definitely NOT a highlight), or the warmth of birthday wishes from friends and colleagues (you’ve got to love Facebook for reminding them all don’t you), it was the birthday cards that my family gave me. The always-thoughtful card from Father of a Man-Child. I swear he missed his calling – he should have worked for Hallmark. Every card he writes for me (or someone else for that matter) always seems to say just the right thing, injected with genuine warmth and emotion that brings a tear to your eye, and words that cause you to stop and reflect on your life. 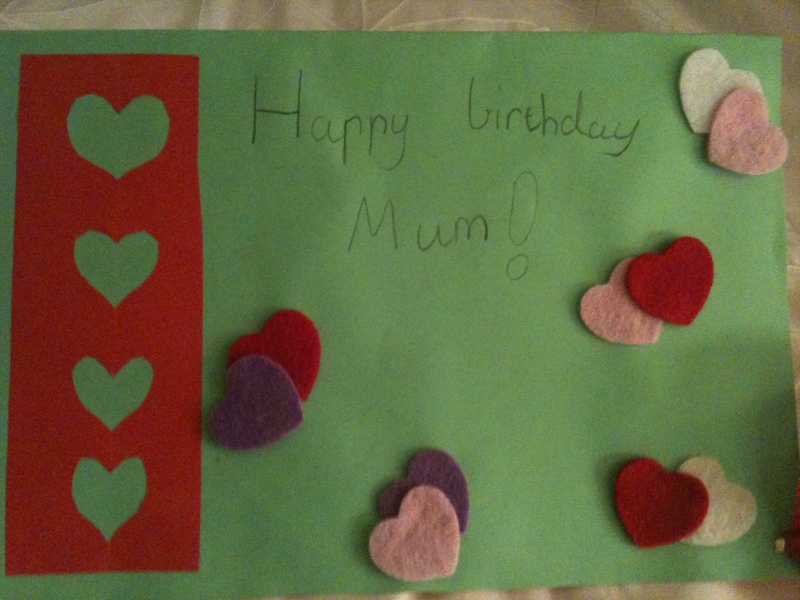 The gorgeous home-made card from Sister of a Man-Child, whose excitement was palpable, even days before. “Mum, what’s your favourite colour? Is it green, and yellow?”. Of course I told her knowingly. And on the eve of my birthday, almost bursting with pride: “Can I PLEASE just show you the front cover of your birthday card Mum”. Patience won! The wonderful card from Man-Child I , “long” by his standards (although he’s an amazing writer, I don’t think he enjoys the very personal stuff much), telling me I’m the best Mum he could have, and thanking me for everything that I do for him. Perfect! In a moment you forgive everything of a child when they say this. And last but not least the surprisingly mature card from Man-Child II, talking about his own attitude as he grows up, and the fact that he is enjoying the company of his parents more and more, and doesn’t mind spending time with us. And of course loves his mother, and all that she is. This attitude change is a turning point for an adolescent, and really does represent a shift in the parent/child dynamic, an indication that we’re on the way to “coming out the other side” with at least one of the boys. My wonderful day ended as it should with a simple dinner out with our children. Pizza and pasta provided the perfect opportunity for the boys to carb up ahead of yet another rowing regatta, and Sister of a Man-Child was in gelati heaven, just proving that you don’t need a fancy restaurant to enjoy a night out and the simplest things in life can bring you much happiness. Here’s to the next birthday – I can’t wait to relive the joy and love I felt on that day in another year’s time. Technology – can’t live with it, can’t live without! Smartphones, iPads, laptops, smart TV’s……the digital revolution is amazing and literally engulfing us all like a giant tsunami. Of course the digital natives don’t know any different. And even though I work in the digital space every day, I was more than a little surprised when Sister of a Man-Child, now 8 years old, asked me recently for her own email account. She even told me she’s already decided a “name” for Gmail. I said no, straight away. No because I didn’t want her having an email account that she could use to email her friends just yet, no because I didn’t want her having a SPAM account, where all those marketers (like me) could send her countless invitations to impart private information and sign up for countless offers. No because she’s only eight years old, and it just seems wrong. She signed up for a website recently, created especially for kids, with all the right rules and regulations etc, and you could even pay a monthly fee for premium services. I gave in eventually when I found out quite a few of her friends were on it, and I was the only tight-arse parent not paying the subscription fee! Seriously though, it was Facebook for under 10’s! Totally getting them into online chatting, making friends, “buying” stuff….quite alarming in my view. Even more so when her friend’s mother rang me to say their 8-year-old daughter had amassed several hundred “friends” on the game and they were closing her account. Good move! I happily cancelled my daughter’s account the same week – peer pressure can be used to your advantage sometimes. As for the Men-Children, they’re as obsessed as the rest of them. They have iPhones (naturally), but they no longer have their own laptops. We did buy them one each in Year 7 – not that it was mandated by school, but we thought it would be useful for homework (wishful thinking perhaps?). They’ve both since given up the ghost, the boys haven’t bothered to get them repaired (they only need a new charger/cord), and the boys had made do with mine or my husband’s Mac (we LOVE Mac’s). However, we’re now down to one Mac (damn it when you have to give back the work Mac) and as I’m on my work laptop (sadly not a Mac) most nights for work, they’ve been forced to share. So for Christmas, top of the list for one Man-Child is a Mac. Yes, not just any laptop, which you can buy for $4-500 bucks, but a $1,000 Mac. Marketed so successfully that they enjoy a premium position and therefore premium price – they NEVER discount – haven’t you noticed damn it? Apart from the cost (he even offered to make it a combined Xmas/Birthday present – it’s still too expensive), we’re loath to buy them a laptop each. For the key reason, we don’t want them on them (read Facebook) 24/7. They still don’t need a computer for homework every night, and we know for a fact that if they’re on the computer, they’re on Facebook, which means they’re NOT doing their homework. Yes you can search Google and Wikipedia and be on Facebook at the same time, but we all know how easy it is to get distracted by that wall don’t we? I even found one of the men-children on Facebook at 7am in the morning, before he headed off to rowing. Just grabbing a quick look before we headed out the door – seriously!! I’ve talked about technology and Gen Z before. Read more here. As the boys approach their 16th birthday early next year, conversations at the dinner table have turned to their next rite of passage – the driver’s license. Surely for a boy one of the most prized of possessions, second only to the car they both hope to own of course. Man-Child I for years talked about the Ferrari he would own as his first car. I for years told him I hoped that he’d be that successful one-day, but it was unlikely to be his first car. Was that mean of me to quash his dreams and give him a dose of reality? I didn’t do it when he was very small I promise. At any rate hoon laws would presumably prevent it anyway. The downside of being a twin, is that both will need to clock up their L-plate hours at the same time. As I understand it, you need 120 hours practice for an automatic license, and 180 hours for a manual license. This puts them at a distinct disadvantage to non-twins, as they can’t both drive the family car on outings simultaneously. As an added complication, it seems Man-Child II has decided he wants his manual license (Man-Child I is happy with an auto), and somehow convinced Father of a Man-Child that buying a cheap $5,000 Jeep would be the perfect car to practice driving in!!! Of course it could be that Father of a Man-Child was also thinking about the fun he could have over summer getting around in a Jeep (mid life crisis anyone?). Mother of a Man-Child being the practical one of the family, said, hmmm, so you think the family are going to go out in a busted $5,000 Jeep just so you can drive us around and clock up your hours? No probs he said, Dad and me will just do a few drives to Kangaroo Island and back (about 11 hours one way). You do the maths – that’s QUITE A FEW drives to KI and it’s not going to happen. His other solution was that everywhere we go we’ll take two cars – Man-Child I chauffeuring me in the much-loved automatic family wagon, Man-Child II chauffeuring his father in the manual Jeep. Oh yeah, we’re getting even more practical now aren’t we? I remember getting my own license. We were very lucky to have a close family friend who offered to take me for driving practice regularly. Do you think he knew that the worst teacher for children is their own parent when it comes to driving? The child hates being told what they’re doing wrong, the parent is shitting themselves and seeing their life pass in front of their eyes at every intersection. A recipe for disaster surely? Maybe Father of a Man-Child can help them clock up the early kms, he’s less of a stress head than me. I’ll take over when they’ve got some mileage under their belts and are more practiced. Of course, deep down I live in fear of the day they have their license at all (as you all should!). I am a firm believer that testosterone loaded boys should not be allowed behind the wheel of any car until they are at least 21 years old. The statistics show I’m right. That’s not to say my boys won’t be careful, and thankfully the laws are now so stringent I think they are inclined to be much more cautious about drink driving etc, yet the numbers still show this group are over-represented in deaths on the road. (Sorry I’ll get off my soapbox now). I have always maintained that I will send my boys (and in time daughter) to one of those safe driver courses once they have their license – if they’re on the road, then at least equip them with all the skills you can. Added insurance. So time will tell whether or not we end up with a 3rd car in the driveway. As Man-Child II pointed out quite matter-of-factly, eventually there’ll be five cars out the front Mum, so get over it. Good lord, Sister of a Man-Child is only seven years old – does that mean they’ll be here for another 11 years? Just as well we went up isn’t it? Man-Child I and Man-Child II aren’t that surprising. They do all the usual teenage boy things, push the boundaries, and the friendship, take us for granted, etc. But sometimes they can surprise and delight when you least expect it. On two recent occasions I have been pleasantly chuffed at the behaviour of my boys. On a recent birthday, Man-Child I presented me with a personal letter. Not a short card but actually a hand written note. The contents warmed my heart more than you can imagine. With sentiments like “you are always putting everyone else first”, “I know you are always right”, and “there’s not a mean bone in your body”, I was in Mother heaven. I lapped up every word, and enjoyed the incredible positive vibes it gave off, knowing that in a heartbeat we could go from such bliss to a screaming match over absolutely nothing. Such is life with teenagers! A cynic might say he knew all the right things to say and that actions speak louder than words – and yes he did in fact compile quite a list of wonderful affirmations about me. But he also knew that to commit it to paper and hand it to his mother meant a lot – a permanent record of his love and devotion, not often worn on his sleeve, but always present, just beneath the surface of his skin. I’d love to quote every word, but that would be unfair, and somehow de-value the beauty of the often-handled letter that I can’t bring myself to throw out – ever. Which brings me to Man-Child II, not quite the letter writer of his twin brother, but he has his own way to disarm a grown woman. Having marked the same birthday with not even a store-bought birthday card, he completely redeemed himself on Mothers Day recently. I was presented with not just a card, but a gorgeous ruby glass heart-shaped vase. Man-Child II not being much for words, the small but important gift said it all. He even acknowledged that he had been embarrassed to not even write a card for my birthday – an apology said in a different way. I was chuffed. The vase now has pride of place on my dresser, and the card lives next to my favourite letter. And in case you’re wondering, no his father didn’t put him up to it! Today we celebrated the 14th birthday of our twin boys, Man-Child and Teen-Child. My husband made the generous offer of getting up early this morning to cook them a bang up brekky on the BBQ, before they headed off to school. Of course he indulged also. After school they caught up with their mates and hung about, and then their grandfather shouted them out to dinner. All in all a pretty nice day. What is incredibly scary is to look back at photos of one year ago and see the baby-faced pre-pubescent boys that were my children, and now look at the little men in front of me. I kid you not in one year I really believe that they have each grown at least 6 inches, and their feet have grown 3 sizes. Whilst the shoes have been replaced in rapid succession, fortunately as they have get taller, they have been able to wear the same size clothes for some time, because whilst they go up they don’t normally go out – in fact one of ours got thinner over the last 12 months as he lost his “baby-fat”. So not surprisingly at the end of the cricket season there were many gangly teenage boys with unfashionably short cricket pants – I for one was completely sympathetic to the mothers who refused to replace them so late in the season – they can make do until next season. In these days of social media, it wasn’t surprising to see the constant stream of birthday messages for the boys on their Facebook pages. I admit it was quite nice to recently receive so many public Happy Birthday messages from friends across the globe myself. It’s definitely good for the ego and really does reflect the core “social” aspect of Facebook and other similar sites. One of our boys (Man-Child) had mentioned in passing that his best mate had bought him a present for his birthday. I thought at the time how sweet that he would actually buy a gift even though they were not having an “official” celebration with friends. You can imagine my surprise today when Man-Child came home from school with $80 cash – a gift of $50 from a very generous friend, and another gift of $30 from another generous friend. Quite frankly we were more than a little gob-smacked, and actually somewhat embarrassed. As we discussed the fortunes of our son, he made it very clear that of course he would reciprocate with similar sums of money when the same friends had their birthdays. So i naturally enquired if he thought we should be funding that generosity or him? His response: “If you won’t pay for it I’ll just take it out of my bank account!” (said like a spoiled child indeed). Our position is this – at a stretch, if our son feels so strongly about giving his best friend a present, then we might buy a $20-30 present for him (which is the normal budget for birthday parties). But under no circumstances would we feel obligated to match the generosity of his parents, and nor in fact do I think they would expect it. Unfortunately (and clearly he has a lot to learn) Man-Child was mortified at our response, and the fact we were such “tight-arses” (some terms don’t alter after all :)). Without sounding moralistic, if our son’s friend had used his own money to save up and give his mate a present, I would have been delighted. But when he’s throwing around mum and dad’s money, and our son expects the same, I wonder what values we are teaching them? I’m not sure my son will understand what we’re talking about in the near term; it seems it’s only when you are very young (too young to understand), or as you get older (and more mature) that you realise your friends don’t value you for material possessions. Such is the journey of life (and wealth)!